Our mission is to match pigs (and other pumpkin-eating animals) with un-carved, non-inked/non-painted pumpkins to prevent them from being thrown in the landfill. 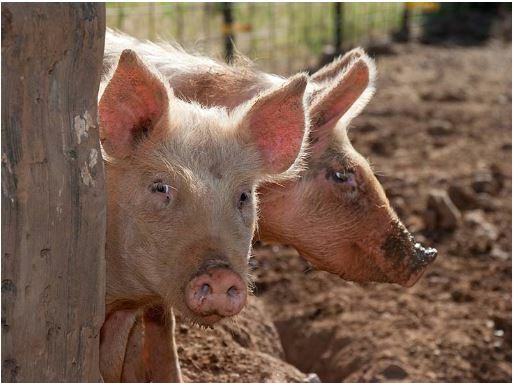 They are excellent feed and a wonderful treat to the animals on the farms and sanctuaries. They also make great compost. Thanksgiving comes up and we start moving to the next holiday but often our pumpkins are in perfectly fine shape, and its a waste to throw them out when they are still useful. 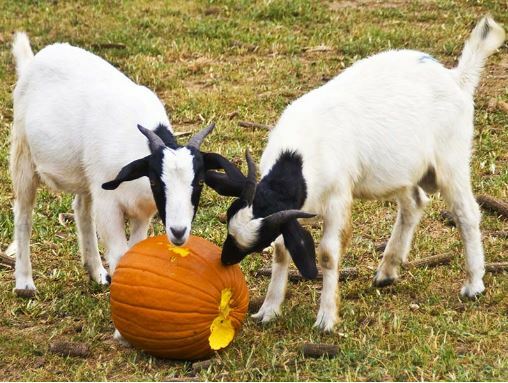 From October through mid-December you are encouraged to donate your un-carved, non-inked/non-painted pumpkins to your local farm or sanctuary. (Some organizations will also take them for compost so inquire!) When you go out to purchase that perfect Christmas tree at Thanksgiving time, take your pumpkins with you and donate them to a one of the organizations below that are along your route. Also, when you buy your tree, ask if they have a recycling program; some goat farms would love them for their feed. How did Pumpkins for Pigs come to be? Seems so simple. Well, it was. I was feeling increasingly guilty I didn’t have a better way to dispose of my decorative pumpkins come Thanksgiving. So, I kept them until Winter officially started – yeah, we looked weird having pumpkins with a winter holiday wreath on the door but I was biding my time hoping I’d come up with something. There had to be a better option. One year, while visiting my farmer for eggs, I asked if he had any ideas. He invited me to drop them off on my next visit as their pigs would love them. It would be a real treat for them. An idea was born. I was – and still am – positively giddy about the prospect. In reaching out to local farmers, I found they were trying to find ways but simply didn’t have the time to put the word out. We are starting out small – just 4 places that will accept them – with the hopes it will grow. With the gracious help from a life-long friend who makes websites for a living, we now have PumpkinsForPigs.org. Give your pumpkins to the pigs.